I help companies become massively successful with Microsoft. Go ahead, apply to the Kinect Accelerator, you won't regret it! Is your product a heart pump or a blood test? Seesmic Desktop 2.0 is Launched! justin bieber shoes on Go ahead, apply to the Kinect Accelerator, you won't regret it! Louis Vuitton Bags on Is your product a heart pump or a blood test? FactOn is the kind of company that I always expected to find in Germany. So here is the story. Two brothers, one is an accountant, the other is an engineer, both are working at Daimler-Chrysler. One is complaining about getting decent production cost estimates on new product designs and the other is describing what a pain it is to create these custom, and soon worthless, spreadsheets for every one of their new development projects. Ba-ding, light-bulb goes off, Dr. Hassno Plattner, who built a little company known as SAP, steps in with some funding and advice, and you have FactOn. FactOn is purpose built for estimating the cost on things you build – mostly widgets or whatever for cars, lawn mowers, airplanes, etc – this manufacturing segment is known as discrete manufacturing. I was happy to dig into an hour + demo of the product. At first, it looks like a spreadsheet – or one of the many spreadsheet like budgeting planning tools, but then you drill into a product for costing and you see the good stuff. Just to set the context of the review, I was an engineer undergraduate and was hired into Boeing right out of college. My first job there was building manufacturing systems for graphite epoxy production on the B2 bomber. So, what is the first thing a rookie engineer at Boeing does? Cost studies. You watch folks putting planes together with a stopwatch and a clipboard. Then, working with the aircraft designers, you put together detailed "Manufacturing Plans", pull out all of the cost data collected by you and all of your other rookie friends, and you build meticulous cost analytics reports – which get rolled up by hoards of accountants into the product costing of an airplane, or car, or backhoe, or other large device. So, what Facton's James Denman demonstrated to me, was exactly that, all online, doing in clicks what had taken us months. Now, the German part. Drill through any one of the steps and you get details behind each machine, set-up processes, cycle times, maintenance allocation… there is a place for every detail. FactOn is working with a variety of data suppliers so that planners can start with the data already in FactOn. As data is developed for your own manufacturing process, FactOn also can make that available to the rest of your company or to your customers, for use in their own planning activities. But, the benefits of FactOn do not stop at the creation of a cost estimate for a newly engineered part, that is only the beginning. FactOn allows you to collect manufacturing data and compare it to your estimates so that the actual cost, or the key cost impacts, can be evaluated and refined allowing very accurate costing of production runs. This ability to see and continually refine accurate costing in a discrete manufacturing company is often the difference between profit and loss. Effective cost management also allows more accurate pricing and a more competitive company overall. FactOn just opened an office in Detroit, Michigan, and you can sign-up for a free demo version of their solution. Our Microsoft EBT focal in Germany, Carsten Rudolph, has been supporting FactOn in Germany. With their recent entry into the US, I am working with them now to get more global visibility. FactOn is a Microsoft application and has extensive integration with Excel. With the recent launch of Microsoft's PerformancePoint, there would be some natural integration scenarios, allowing a manufacturing company to see actual cost vs. originally forecast and refining the data to optimize both future development activities and current production runs. All in an easy to use online and Microsoft Office based environment. Sometimes you feel that you are witnessing a little bit of history. These last two days at the Workday Rising event in San Francisco had that feel. On the surface, Workday is a SaaS ERP solution, founded by PeopleSoft veterans Dave Duffield, Aneel Bhusri and Stan Swete, that is taking aim at the upper midmarket, but actually, they are much more than that. Now, wouldn't it be nice, to take decades worth of tacit knowledge in how businesses operate, and how they can best – note "BEST" – leverage information technology, then, pull out a clean sheet of paper and ponder, with all that we have today, bandwidth, Web 2.0, agile dev methods, mash-ups, dozens of deployment options, etc, and how would I build this today? That is exactly what Workday set out to do and has delivered. With deep pockets, a seasoned, passionate and innovative developers, a new crew of Web 2.0 young'ns, and the 'ol PeopleSoft, people first culture, Workday has lots going for them. I am also proud to say that they are one of my Accelerator companies. Microsoft is working with Workday to create extensive Microsoft Office integration scenarios. In one breakout session I was able to demonstrate Microsoft SharePoint 2007, with data published, and dynamically updated, into the Business Data Catalogue and into an Excel analysis spreadsheet which was published into Excel Services. Workday gave us a "sandbox" environment that provided us with data and web services to create our demo. The demo developers at Softagon, the contractor we used to build this solution, said that it was the easiest integration that they had ever done, by some margin. The demo worked well, punching through the hotel firewall, refreshing the data, and showing the SharePoint mash-up of data. This was a proof of concept, but now we are taking it to the next level, tying it around some specific customer scenarios, bringing together a few SaaS solutions, a few on-premise ERP pieces and some custom applications, and creating a role focused composite SharePoint solution that brings these disparate systems together into one view. Whilst we at Microsoft were creating our SharePoint creation, the folks at Workday were busy building Excel integrations, a mail-merge, etc. What Workday built into their 2.1 product, due out in November, is the ability to publish any report as a REST based web service. So, whenever a user runs a report, there is an URL down below the report, cut it, go to Excel-Data-From Web- paste. Now you have a nice data table that you can pivot, sort, format, etc. Save it, open it, and the data refreshes, after user authentication. Paul Gustafson from Workday showed some great solution scenarios to a packed house of eager Excel users. Workday has over 20 customers now and has recently added Financials to their offering. What is interesting is that Workday is building financials with the worker as the core business entity, not account. The GL chart will not be hard coded in the system, but rather created as data is reported. This will be done in a GAAP compliant manner, but people and process are the core attributes and financial execution and history are the byproducts. This has been tried before but has often stalled due to the tacit knowledge legacy of numeric, multi-segment, chart of accounts definitions. But, if you do achieve it, your business is no longer controlled by the definition of a chart of accounts. If you need to re-org, just do it, and the cost centers will adjust to your new organization model. Same with products, geographies, and everything else that is coded into most company GL's. There are many complexities here, but with the object oriented, in memory database platform that Workday is building on, and their knowledge of the old and new, my bet is that Workday can pull it off. After my own 20 years in ERP systems deployment and development, Workday has delivered a truly innovative, but usable solution, that breaks the molds of the past creating the productivity potential of a next generation of ERP systems. Oh, yeah, and by the way, Workday and Office 2007 absolutely rock together, perhaps one of the industry's best examples of Software (Office 2007) + Services (Workday). Me.dium is truly breakthrough. I have been using it since I first saw it at DEMO 07, on the FireFox browser. Now they are through the third beta on the Microsoft Internet Explorer and it is getting pretty stable and even more fun to use. Go to Me.dium.com and sign-up for an account, it's free. Once you get an account, you can add friends, for example, if you want to add me, my Me.dium user name is MSFTdave. Of course I have a chance to accept you, so if I have no idea who you are, well, I can get rid of you. You can also look folks up by their e-mail and invite them as friends. See what your friends are up to… Once you have established your friends network, and they have Me.dium installed you can see what web sites they are on in the little friends tab. The friends tab is in the Me.dium side bar that is installed when you install Me.dium. If you want to chat with them about a particular site, you can click chat, or you can just click the site referenced and see what they were looking at. The other day, I noticed one of my friends shopping at Thomas Pink shirts, and since I was in the market for shirts too, I clicked to check it out. I have always been a Brooks Brothers guy, but those Pink shirts look pretty nice . Every month, as part of my work here at the Emerging Business Team, I look at every business application company that gets funding and is reported through VentureSource. Since we just brought in feeds from Europe as well, I had a big pile this month, 50 companies. Now, my standard practice is to open-up Me.dium as I browse through to each company. You can see where people are coming from (what they browsed prior to visiting) and where they went after – notice how the SAP site showed up here, SAP had just published new benchmarks – which I noticed and went on to investigate. Me.dium goes beyond tracking what your friends are up to. When you install Me.dium, it installs an add-in that keeps track of what you are doing in the browser and reports it back to Me.dium. Ok, yes, there is some trust involved here. It also turns off automatically when you go to your banking site or any secured site. But, based on the tracking of all the Me.dium user behaviors, they do some very, very cool stuff. Me.dium creates this radar view of where you are, where your friends are, and where the world is. The world is filtered down to users that show browser behavior similar to yours – which scopes the radar view down to a few web sites. Navigation tracking and attention at a whole new level: Because Me.dium is entertaining and useful enough to have a very large audience actively use their application; they are able to gather a tremendous amount of detail on user behavior. Thus individual preferences and navigation trends are available for add placement and market research as well. Well funded and rapidly adding users, near 20,000 downloads, Me.dium recently raised $15M, led by Waltham, MA, based Commonwealth Venture Capital and joined by Colorado based Appian Ventures and Boston based Spark Capital. That brings their total backing to $20.275 M based on VentureOne. Last week Dan'l Lewin and Don Dodge joined me for a tour of cool ISV's in the Boulder/Denver area, a visit with the tech startup incubation initiative, called TechStars, and a VC Roundtable which included many of the influential tech VC's in the Colorado area. A big thanks to Brad Feld for helping coordinate, find the right people to meet and coaching us through the meetings and events – here is Brad's post, http://www.feld.com/blog/archives/2007/07/microsoft_visit.html. The cool ISV's we visited were, Electric Rain ( www.erain.com ), Newmerix ( www.newmerix.com ), Lijit ( www.lijit.com ), Gold Systems ( www.goldsys.com ), Rally Software ( www.rallydev.com ), Me.dium ( me.dium.com ), IP Commerce ( www.ipcommerce.com ), Accellos ( www.accellos.com ), and Newsgator ( www.newsgator.com ). There were a few standouts, Don Dodge fans, and plenty of follow-ups from the visits. But, consistently high quality companies with very interesting solutions. We stopped by TechStars ( www.techstars.org ), and had a great chat with some budding entrepreneurs. Fortunately, we were able to help one of the companies, SearchToPhone , resolve some issues with Tellme, so they could get their demo live. Only one of the companies is using the Microsoft stack – largely because their lead developer is a veteran Microsoft developer. SearchToPhone is using a mixed platform + Tellme. We had a great conversation concerning why – mostly because of perceptions around cost and control. David Cohen posted a good summary on the TechStars blog ( http://techstarsblog.com/2007/07/13/microsoft-visits-and-goes-deep ). Don Dodge had a chance to join Brad Feld and 100 other Boulder technology entrepreneurs at the Boulder New Tech Meetup on the University of Colorado campus. Here is some of the blog coverage from that event http://www.rubiconventures.com/2007/07/boulder-denver-.html . Don had a chance to pitch the EBT to the group and had a few fans in the audience. Dan'l and I headed to Denver for a darn good meal and greeted the ISV of the year and ISV innovator of the year award nominees. Since WWPC was in Denver we were able to fit in the ISV nominee event. Digipede, one of our EBT sponsored companies, won the ISV innovator of the year award – which is a pretty big deal. I met with John Powers, the CEO of Digipdede the next day at WWPC and he couldn't be more pleased. The Colorado VC Roundtable was a good re-introduction of the EBT to the Colorado VC's. Most of their activity is early stage and the startup community is not slowing down, so this was a good opportunity to make sure Microsoft was in the platform selection process for their companies. I now have a few Microsoft startup day's scheduled at the local firms. Thank you to Sanjiv and Nav – for creating much of the materials that I copied. Thank you Nicolas for coaching me through Silverlight, Live and Popfly. Thank you Dan'l and Don for coming out and bringing the crowds. I have been around business systems for over 25 years, from implementing some of the largest and most advanced applications on the planet to shipping software products for small and medium sized businesses. From punch cards to PC’s and timeshare to SaaS, some things change and some stay the same. But now is a very exciting time for business. There is an inflection point where the division between technology, function and human behavior fades away and the focus becomes execution. Like in sports where an athlete wields a piece of technology, say a tennis racket or golf club, but neither focuses on the tools or how it came to be, but on the task at hand, a 100 MPH serve. I believe we are approaching this point, globally, in business. In the last 130 years we have evolved through 3 main iterations of information technology in business. First we had the industrial revolution with the steam engine behemoth powering the factory, tremendous economies of scale and new management science organizing hundreds to account for the activities of the ever larger businesses. This era grabbed onto the computing equivalent of a steam engine with the first generation of mainframes. Then came the era of empowerment and division level autonomy that broke the centralized business mantra and ushered in client server computing which evolved through ever improving architectures to our current state of SOA loosely coupled heterogeneous systems of today. In my personal experiences I have had the opportunity to see and be part of many business operations, some wonderful and some quite horrible. So, this, combined with what I see going on globally in software solutions and business services, has led me to these tenets for Business 3.0. Some exist, some are in process and some have been tried and tried again, but the nut has not been cracked. These are just ideas, but this opens the conversation. How are these tenets going to come to be? Today, you can assemble your business, online, with minimal capital. Some services are outstanding and some are getting better. In the first generation businesses leveraged their economies of scale to build out their own logistics and operations infrastructures, think Sears, Roebuck and Company or US Steel. In the second generation large businesses outsource providers evolved such as Fed Ex and ADP. Today, businesses of any size can outsource portions of their operations, or skip the high capitalization of infrastructure and rent their operations from new companies like ShipWire, Authoria, Perquest, Rearden Commerce and the incumbents like Amazon, eBay, and Yahoo!. You have to be both. Our first generation huge enterprises had to invent and build out their own infrastructure because the capabilities did not exist. But the weight of their highly capitalized infrastructure also became a burden as new businesses emerged worldwide with less constraints and a new generation of capabilities. So, just as your fixed costs drop through the floor and your margins become oh, so tasty, a new competitor appears and changes the business model. Now, those tasty margins cause a bad case of cognitive dissonance and you dispel those new business models as being short lived fads. Your great margins are eaten away by the new business model and you now don’t have the cash flow to leverage up and build new infrastructure. Incumbent dies and new model wins. But what if you pay for what you need and rent as you go. Big AND agile. It wins in any sport, and wins in any business too. The offerings are neither affordable nor complete, but they will be. Now for the Web 2.0 / Enterprise 2.0 spin. Humans are just plain useful. They learn quick, are tremendously adaptive and given the proper incentive structure, are economical as well. I spent 10 years of my life building workflow systems, neuronets and AI solutions to mechanize things that humans were actually pretty good at. Result was, humans are better and cheaper, especially in business environments that are changing rapidly (which is about all of them today). But, machine assisted humans are even better. Allow humans to share knowledge, interact, collaborate, and persist their thoughts and shazaam, humans can scale, globally. Search, Wikis, RSS feeds, RSS catchers, IMing, VOIP, Collaboration, OnlineMeetings, Review sites, Rankings, rent-a-resource, etc. Let the business social begin. Trust is the basis of business and relationship is the basis of trust. But relationship does not scale. It does not scale regionally, nationally or globally. It is restricted by time for relationship building and is challenged by cultural divides. Our current compliance crisis has resulted in us attempting to litigate trust back into business. As a result CEO’s and CFO’s are going to jail and systems like Approva are being implemented to make sure jail is not on the horizon. In many corporations, large vendor management organizations are essential to ensure vendors deliver and can be trusted. Auditors verify financial reporting practices so that markets can trust the information pertaining to the businesses that they own. But, today, we can be much more transparent. We can collaborate regarding the quality of our vendors, shine a light on our financials, publish investment roll-ups and rank our competencies. The history of business has been based on circles of trust that were tightly held in small relationship groups. Trust is essential to allowing businesses to share services. This is a greenfield for the next generation of business. If we are to share services, span systems from local devices to mobile devices, to global data centers, to local data centers, our machines must know who we are. One of the essential elements of an ERP system is user authentication and then role definition. Every feature, every piece of data and every action is controlled based on a user’s role. Every security system for every business system is unique. The scale integration of SaaS and business services will not occur until the integration barrier of identity is broken down. One identity with a business role definition is essential. Solutions like InfoCard and SXIP are essential, with business role context ( and multi-tenant corporate understanding as well). I have my friends at IP Commerce to thank for this one. Money is data that is inventoried by our respective governments. Those inventory systems are under revision. I am not a banking expert, so I will leave it at that for now. Payment is changing, in big ways, and banks, as we know them, may or may not be included. I could not resist. This one has always been a dream of mine and perhaps I have spent just a little too much resource to achieve it. As CTO of FRx Software for a while, I had the privilege of managing the construction of applications for financial reporting and budgeting. But Budgeting always fascinated me. Most organizations budget by taking last year’s budget and increasing it or decreasing it by X%, which may or may not have much to do with how you are going to spend the money next year. But we have massive amounts of data in our ERP systems and when you consider the shared data of all the SaaS systems out there, holy cow, we have tons of data to look at. The tools and technology exist to look at all that data, so let’s put some good design behind it and put it to good use. It is about time that we moved past histograms and line charts. When I watch my son play Halo I can’t help but think how he could use that same interactive skill to plow through piles of data and make decisions at a rate that is orders of magnitude beyond our current speed of business. Quality used to be the driver behind productivity. But now quality is not enough. Design matters, as I chatted about before, and matters even more today. From software services to steering wheels, many of the things we use today and will use tomorrow have been around for a long, long time. With technology reducing the constraints of both the design process and manufacturing, creating tools that are easy to use is just as important as creating tools that are useable. Everything from soup to SaaS is being designed to be easier to consume. Thus, assuming existing quality practices and evolution, the premium is on design. This is one of the most exciting and beneficial aspect of the current business revolution. So, I finally got this out of my head. Now to find the doers, the builders, the engineers, the creatives and the entrepreneurs who are going to build this new world of Business 3.0. Fortunately it is my job to seek, find and interact with you, so please, let me hear from you, because we need better business. The same goes for good cheese. I was traveling in Europe recently and I worked with two of my EMEA peers, David Rowe and Julien Codorniou, to meet with some other companies in the region. First of all, there are some absolutely great start-ups in EMEA and it was a thrill to visit with them. But what really caught my attention was the great SaaS applications that are getting serious traction in EMEA. And guess what, they are all on Microsoft .NET. In Paris, I had the pleasure to have lunch with Philippe Amand, a great Thai meal by the way. Philippe's new company is idylis, at http:\\www.idylis.com, uh, yeah, it's in French. Philippe has built business solutions before. He built the French product Ciel and sold it to Sage back in 1992 and continued with Sage for some years. But with the emergence of the ASP trend in 2000, he saw the opportunity for making ERP real easy to buy and consume via the web, and he built it all on the Microsoft stack. When asked why his team chose Microsoft as the platform, his response was that it was easiest and quickest platform to build with. They evaluated all of the alternatives, and went with Microsoft. Many are making the same choice throughout the world. In fact, if you are looking for an easy, and cost effective way to get cooking on the Microsoft stack, take a look at the new SaaS on-ramp program. Pascal Mercier, one of the investors in Idylis, also joined us for lunch. Pascal, who is with aeliosfinance, provided some insights into the French venture community, especially in regards to software and high tech. Thank you Pascal. After a quick Chunnel train ride to London, I had the honor to meet with David Terrar. I was excited to meet with David for a couple of reasons. First of all, David is one of the Enterprise Irregulars, which is a group of folks who have been building, deploying and working with business apps for some time, but are engaged and watching the current transformation of business systems in our connected world. Secondly, David is working with a rapidly growing SaaS ERP solution called Twinfield. David hosted me at the Institute of Directors in the heart of London, which was an excellent place to meet. Twinfield, like Idylis, chose the Microsoft stack for their SaaS ERP solution. David and I swapped stories about building ERP solutions over the past 15 years or so and he was able to give me some of the background behind Twinfield. Well, I discussed good design in my Design Matters blog posted earlier this month, and with a well built SaaS ERP solution, design does matter. Many of the Twinfield team worked on CODA, which is a well respected financial solution. Building solid business solutions takes a development team with solid domain and technical expertise and by looking at the Twinfield solution, their team has both. On a final note, don't miss David's post on our meeting on his blog site. At Convergence EMEA in Munich, Germany last week Microsoft Dynamics team recently announced new licensing terms for all of their ERP products called SPLA. SPLA stands for Service Provider License Agreements. The new SPLA allows ISV's and hosters to provide any of the Dynamics ERP or CRM solutions to customers. These are the same ERP products being deployed on-premise today, but unifies the different hosted solutions licenses under one consistent Microsoft license program. This is the exact same licensing program that is being used for Windows Server, SQL Server, Exchange, etc. Yes, this is not SaaS (in the true mult-tenant definition) - but it is not intended to be SaaS. This is a key step in unifying the licensing across all Microsoft products in the stack so that service providers can host a complete Microsoft ERP solution and all additional Microsoft products under a single subscription fee. One of the shifts that Microsoft has observed in the evolution of SaaS solutions is that simplifying licensing, and providing a wider variety of payment options, was key to the new emerging software models. So, why not let the customer pick the licensing option that works best for them and that is why we have enhanced our license scenarios to include SPLA. So, what's the big deal. Well, first of all, we have many partners, over 4,000 worldwide, who are hosting Dynamics solutions. This makes their life easier. Secondly, and this is the foundation for the future part, it cleans up licensing so as Microsoft offers Dynamics solutions, as full SaaS offerings, the licensing is done. Now it is matter of baking through the technology to deliver secure, multi-tennant, highly scalable solutions. With the CRM Live announcement in July of 2006, that product is in the pipeline and coming along quite nicely. Trust me, changing licensing models at this scale inside of Microsoft is not easy, but the Dynamics team did a tremendous job creating a solution that fit customer, partner and hoster's needs. Some raised concerns that Microsoft could not really get into SaaS because they where not willing to change their pricing model and potentially impact their current revenue streams. Well, those concerns are void now. The business model adjustments have been made across the core Microsoft product offerings. Now it is a matter of technical execution to provide the breadth of Software plus Service offerings that Microsoft has the competence to deliver. I am riding a train from Munich to Paris (we just rolled through Stuttgart), after attending the Convergence EMEA conference for a couple of days. Since my heritage is German, Bavarian to be exact and German-Swiss, rolling through these hills feels pretty comfy. Now, I am an engineer by training and by nature (it's pretty obvious if you have ever met me), and with my travels, one thing that I notice consistently is how the design of things differs from place to place. Having spent the last few days in Germany, I must say that everything here is well built. Just take doors on the buildings. They are like vault doors – no flex, perfect hinges, well balanced. Well designed and well built. And I am talking about every single door, the hotel, restaurant, quick-mart, bathroom, every door. A friend of mine liked the doors and windows in Germany, so he custom ordered them for his new, "I just sold my company", house. He pointed out that the windows and doors were air tight and had higher insulation ratings than anything ever imported into the United States, which did not surprise me. Not only did the windows and doors cost a fortune, but the "not designed and built in Germany" house had to be extensively modified so that the German quality doors and windows would fit. I have been to Denmark quite a few times as well. Again, everything is very well designed, and usually well built (if it was built in Scandinavia or Germany). But in Denmark, design and aesthetic appeal is a larger part of the mix. So everything in Denmark not only works, but looks good too. Of course, some function compromise must be made to make it look good, but that is OK as long as the balance is maintained. I always think of Bang and Olufsen as the classic example of Scandinavian design. In England you have great design and craftsman focused manufacturing, but there is a traditional styling undercurrent that permeates everything. A Land Rover is a well engineered piece of equipment (owned by the Germans now), but it does not look like a Hummer. I own a Jaguar, and I really like it. I also own a Dodge truck. But when you want to rev it up, be comfortable and look presentable all at the same time? Go with the Jaguar. Most of the goods designed and manufactured in England are that way. Comfortable, solid, useful but not too complex, in a word, clever. I have been in Japan a few times and it is fascinating. There are gadgets for everything. The attention to detail is tremendous. From the choreographed sequence of serving a noodle dish to conveniently placed vending machines. Similar to the Danish everything has a balance of design, aesthetic appeal and function, but there is a minimalist element that is thrown, i.e., only use the materials necessary. Note that I said minimalist, not simple. If there is a problem to be solved, then there is always a solution, no matter how complex (the park-it-self Lexus would be a good example). So, although everything is clean and functional, but cost half as much and uses fewer materials than the German "stout" equivalent. And then there is America. The ultimate cultural Mash-Up. Americans are so inventive because we do not have any inherent culture, we borrow from all of our cultural influences. Thus, when attacking a collection of problems, we normally have an eclectic combination of skills and cultural influences from most of the cultures in the world (with a heavy bent on northern Europe). DNA may work in here somewhere, but I am not educated in hereditary genetics. So we get the problems solved, but we may need to get some German, Danish or Russian influence. Ingenuity is the key driver and the tenacity to create, borrow, or make-up whatever is needed to get 'er done. So you get some nice designs, like a '57 Chevy Belair coupe, and some nasty anomalies, like the Ford Edsel. So, what does that have to do with software? Well, in my role, I see lots of software. I have been building, using, implementing, and marketing ERP software in some form for more than 20 years. I have a global portfolio, so I get to see products from all over the world. The design characteristics by culture that I described above would be somewhat consistent. At Convergence I went through a dozen demos and reviews of functionality. In our agile, "cool", Web 2.0 world, I crave well designed, well built, purpose targeted solutions. Many, unfortunately, are not. When I see a product that really impresses me it is because they understood and solved the business problem. The really good ones invested in designing a solution first, and applied the proper balance of user interface design, algorithmic execution, data management and deep, deep domain knowledge (yeah, real deep). With our evolving world of Web 2.0, SOA, SaaS, .NET and now WPF, the resources to build the best business applications are better than they have ever been. I look forward to seeing my next batch of well designed, purpose built, market matching business solutions. In some future entries I will describe some of the latest good ones I have seen. Thank you for registering for Dreamforce '06, salesforce.com's 4th annual user and developer conference, taking place October 8-11, 2006, in San Francisco, CA. Your payment has been processed successfully. Please Note: Your credit card statement will reflect a charge from Woodberry Events, Inc. in the amount of $1399.00. We are communicating in regards to your registration for Dreamforce, October 8-11, 2006 in San Francisco. Because this event is strictly for salesforce.com customers, developers, partners and prospects, we are unable to confirm your final registration or allow admittance to the event. You will be receiving a refund for your registration payment that was submitted. Now, I have been on the road for the last two months and I would welcome the chance to work in my home office and get caught up on all of my activities, especially some blogging. This is the first time that I have been accepted and then kicked out of a conference. I don't work for the Microsoft CRM team, although I do work with companies that may want to partner with our CRM team (most of whom reach out to us). I see confidential information every day and I keep it confidential. I work with my start-up companies to get them plugged into the right development resources, perform architecture reviews, provide business planning guidance and review how the overall industry is developing. 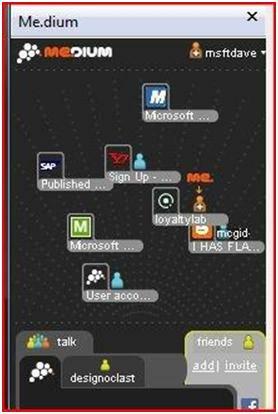 Maybe Dreamforce 2006 is just too sensitive to let a mid level Microsoftee like myself check it out. I may just show up anyway and see what they do with me. I first saw bits and pieces of Avalon about 5 years ago when I was reviewing some new applications being developed in some small skunk-works groups around business intelligence at Microsoft. I asked what they were building the UI in and they said XAML and Avalon. What's that I asked? We were using the early .NET bits and we thought we were on the bleeding edge of the curve. They responded that it is a new XML platform for UI design. My first thought is that will take a whole lotta XML and I wonder if it will work. Avalon became Windows Presentation Foundation and is now .NET 3.0. It is baked-in and boy does it work. If you have not seen any of the WPF demos, you need to. Last Wednesday I visited an ISV, Electric Rain, in Boulder, Colorado who earned their fame building 3D modeling solutions for the Flash designer community. When they first saw WPF, they knew where they were going to take it. Most of our web and desktop worlds are 2D. The Electric Rain tools let designers emulate 3D into the flat 2D world of Flash, but with WPF, they can do true 3D design - oh, yeah, throw in fluid video and 2D/3D animation, and you can do just about anything. The problem is, with more power and flexibility, comes the price of complexity. Microsoft has delivered an authoring tool, Expression, that will allow designers to build 2D, 3D, video and animation components and provide them for assembly, which then you need to do with XAML or in Visual Studio. Building these slick and appealing UI's takes lots of pieces, and lots of wiring together - that means tons of typing, unless you have some decent tools. Electric Rain delivered with the ZAM 3D toolset. This is still in beta, but you can see the product in action on the MSDN Channel 9 site. Here is the link to a detailed demo of ZAM 3D. WPF, aka .NET 3.0, will come native as part of Windows Vista. Even though you may not see yourself as a 3D designer, the ability to put the same kind of 3D animations and graphics into your presentations, web sites and applications is going to let us all have a bit more fun when we are plying away at our computer. With Windows Vista, and ISV's like Electric Rain, you will be able to have some of the fun user experience you are used to on the Xbox, but actually get something done at the same time. Just think, you may be blasting your way alien invaders while achieving your sales quota and rebalancing your inventory. Who says biz apps need to be monochromatic, text based, drop down list boxes? Put some Xbox into your apps.